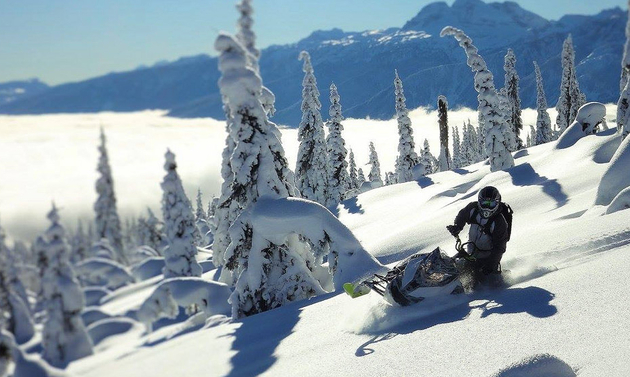 With top-quality snowmobile trails, accommodations, snowmobile rental facilities and dealerships, Revelstoke is a natural choice for your next sledding trip. There are resorts and restaurants there to enhance your stay when you aren’t busy carving up the terrain and enjoying the fabulous snow conditions that Revelstoke is known for. 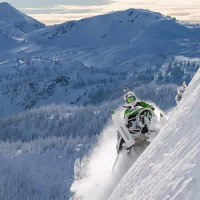 Main snowmobiling trails in Revelstoke, B.C. Other snowmobiling trails in Revelstoke, B.C. Enjoy 50 kilometres of groomed trails and more than 150 kilometres of bowls and meadow riding. This is a great, well-groomed area that is ideal for beginners, but be mindful that the snowdrifts can be very deep here. It is recommended that novice snowmobilers stick to the trail in this area. This is a small area, but it is popular among snowmobilers in Revelstoke. It is recommended especially for early and late season sledding, and the local club asks that snowmobilers respect the caribou closure areas here. This gorgeous alpine riding area is a visual treat. It is suggested that sledders should bring along an experienced guide if they are new to snowmobiling in Revelstoke. This is an ideal family riding area about 40 kilometres south of Revelstoke. The local club website warns riders to stay off the lake, however. If you're up for non-groomed trails, deep powder and steep inclines, Turtle Mountain has the challenge you are looking for. There is a wide variety of terrain here. This is another family-friendly area, with a mixture of smooth trails and alpine terrain. It is situated 18 kilometres south of town. Access to this area can be challenging, but if you get the chance to sled here you are sure to enjoy the spacious terrain, hill climbs and tree riding. The Eagle Valley Snowmobile Club, based in Sicamous, maintains a cabin/chalet here, and trail fees apply. Revelstoke has approximately 80 kilometres of groomed trails and about 140 kilometres of ungroomed trails. 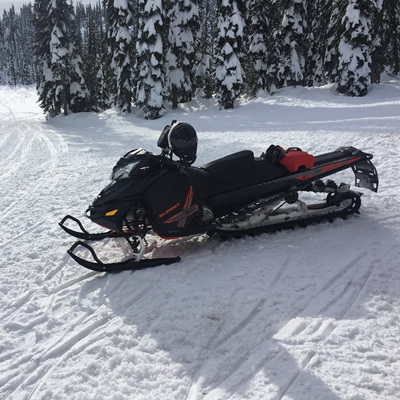 For more information on Revelstoke snowmobile trails and how to find the staging areas, check out one of the Revelstoke Snowmobile Club's trail maps. For a general map of the sledding zones around Revelstoke, download the SnoRiders trail map. Hard copy trail maps are available at the Sandman Hotel, Smoky Bear Campground Resort, Boulder Mountain Sled Shed, Peaks Lodge, Glacier House Resort, Big Eddy Market, Full Speed Rentals. Where to buy a snowmobile trail pass in Revelstoke, B.C. There is a $20 per day trail fee to ride Boulder Mountain and Frisby Ridge; it is collected at the trailheads. Yearly memberships are also available, and these are sold at many of the same businesses listed above and on the Revelstoke Snowmobile Club's website. Visit the Revelstoke Snowmobile Club's website for an up-to-date grooming report. Snow reports and current mountain conditions are also published on the Revelstoke Mountain Resort's website. 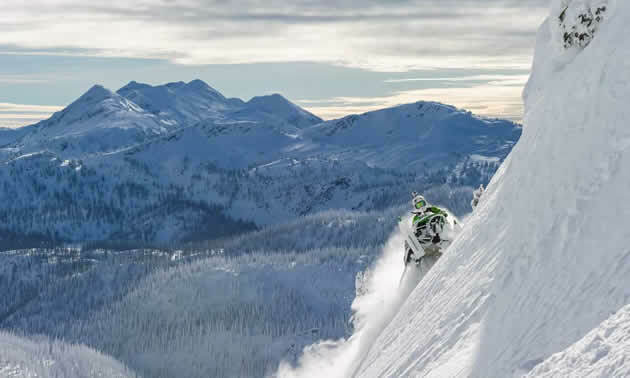 Local snowmobiling events in Revelstoke, B.C. With an average of 750 members, the Revelstoke Snowmobile Club is one of the largest and oldest registered snowmobile clubs in the province. Through a trail management agreement, the club grooms and maintains the Boulder Mountain and Frisby Ridge riding areas. Usually held in March, the Revelstoke Snowmobile Club's annual Vintage Ride attracts a wide array of snowmobiles from bygone eras. The annual Ladies Ride on Boulder Mountain is a much anticipated event that features guided group rides, followed by an evening of fun and door prizes. This event usually takes place in late-March. What local snowmobilers say about Revelstoke, B.C. Frisby Ridge boasts excellent snowfall, and forest scenery that makes for tremendous photo ops. Be careful if you're a beginner - the powder on either side of the groomed trail can be armpit-deep and difficult to get out of. “(Frisby Ridge) has really nice views...and on a really nice day you can see all of the surrounding mountains. It’s kind of the best of both worlds. 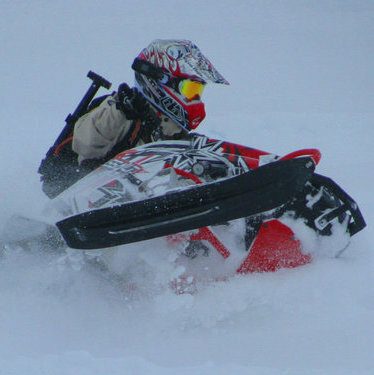 A lot of times the snow around here is so deep that you need to stick to the main areas.” - Rob Alford, pro snowmobiler.